Microwave cooking can be really a simple method of cooking, provided you do it in a correct way. It is not at all complicated, it is just different. All you need is a bit of practice and some common guidelines that are essential for effective and easy microwave cooking. Unlike conventional cooking with gas or electricity, that cooks the food by providing heat from the top or bottom of the pan, microwaves penetrate directly into the food. This saves the energy and the food is cooked evenly from all sides preserving the taste and nutrition. You can cook just about anything in a microwave oven quite easily in much less time than the conventional methods. Let's see how to be a master microwave chef of our home. Timing - The correct duration to prevent under-cooking or over-cooking. 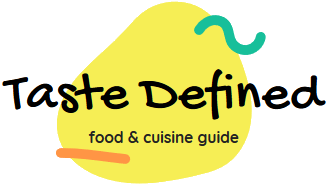 Utensils - The correct type of cooking dishes for fast and even cooking. Methods - Various methods of microwave cooking. It is one of the most important elements in microwave cooking. Like conventional cooking, it takes some time before you are comfortable with right time-durations for different recipes. It may happen that you over-cook or under-cook in the beginning, but gradually you will get an idea about the perfect timings for different foods. Here are some basic rules that may help you in calculating the right time-durations for quick yet efficient cooking. Quantity - Larger the volume of food, the more time it needs to be cooked. As per the directions in your recipe, you can increase the cooking time by 50% if you double the quantity. On reducing the quantity by half, the time is reduced roughly by 40%. Shape and Size - Thin food slices naturally cook faster than the thicker ones. Similarly, small pieces cook faster than the larger ones. For best results, cook pieces of similar shape and size, together. Density - Foods with high density, such as potatoes, beef, and carrots will take longer than porous foods, such as cakes, ground meat, or apples. Moisture content - As microwave energy is easily absorbed in moist foods, they cook faster than dry food. Delicate Ingredients - Food items such as eggs, cheese, and other dairy products may overcook in a microwave. Others may 'pop' viz., snails, oysters, or chicken livers. For such food items, it is ideal to cook for a longer time period with a low power setting. On mixing these foods with other food items like mixing snails to a soup base, one can use a high-power setting. Starting Temperature - Cold food or frozen food will take longer to cook than the food already at the room temperature. Sugar and Fat Contents - Microwave's energy is attracted by sugar and fat, therefore food items containing high sugar and fat heat quickly. Although microwave-proof utensils are widely available, it is always a nice idea to have beforehand knowledge about different cooking utensils that can be used for microwave cooking. Shape - Round or oval dishes are more effective in microwave cooking over dishes with square corners. The round or oval shape generally cooks slowly and evenly, whereas the microwave energy received in utensils with square ends is more concentrated towards the corner leaving the rest of the area, under-cooked. Material - China pottery is ideal only if they don't have metallic rims or glaze. Glass is an excellent option for microwave cooking. We recommend the use of microwave-proof glass for enhanced safety. Paper is suitable for short-term cooking or reheating. Plastic designed for microwave cooking is an excellent utensil to cook a large variety of food. Straw and wood can be used for quick warming, but make sure it has no metal part. Metal use in microwave is a big NO, except thin aluminum sheets. Microwave cooking involves slightly different methods and techniques of cooking than conventional cooking. These methodologies involve the arrangement of food, turning, stirring, rotating, standing time etc. Arrangement - Careful arrangement of food in the cooking utensil enhances the cooking and speeds up defrosting of food as energy spreads evenly across the food. Turning over - Foods such as large roast, whole poultry, a ham or hamburger needs occasional turning to prevent over-cooking on one side. Rearranging - In some cases, you may feel the need to move the food on the outer side to the center and vice-versa. This not only ensures mixing of all spices but also eliminates any possibility of over-cooking and under-cooking. Stirring - Since the outside of a utensil heats faster than the inside, stir food from outside to inside. Microwave cooking requires far less stirring as compared to conventional cooking. Rotating - Foods that cannot be stirred or rotated such as, pies or cakes needs to be rotated or repositioned to ensure even cooking on all sides. Most food does not need to be rotated. Covering - Depending on the type of food, different covering materials can be used. Waxed paper to retain heat and moisture, casserole tops, glass covers, or plastic reps are used to trap steam and prevent dehydration. This increases cooking speed and helps retain natural moisture. Beware of steam burns as you remove the covering and make sure to keep it away from your face. Shielding - Aluminum wrappers (2/3 part open) can be used for thin bony areas, such as the wing tip of poultry, the head of the fishtail, or the breastbone of a turkey, as they cook faster than the thicker areas. Use shielding when recommended in the recipe and do not let it touch the oven walls. Piercing - Food that loses moisture while cooking need to be pierced to break the skin or membrane, such as potatoes, liver, and eggplant. This prevents bursting and allows the steam to escape, easily. 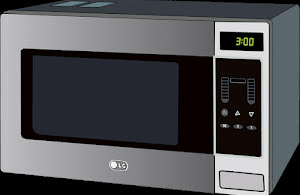 Standing time - This is an essential part of microwave cooking as it lets the microwave energy settle down and evenly spread across the food item. This process helps attain proper internal temperature. Always place food on a flat surface, such as a heat-resistant breadboard or a countertop. Eggs are cooked in special egg baking containers and not with the egg shell. The egg can burst causing a mess difficult to clean up. Microwave is not recommended for deep frying as handling oil in a confined environment of microwave oven is not safe. As no crust is formed in microwave cooking, it is not recommended for baking pan cakes, though it can be ideal for reheating. Crusts don't develop in a microwave oven so it is not suitable for toasting. Heating bottles can break from the pressure built up. Items those are too large, such as 12 kg turkey cannot be cooked in a microwave as there is not adequate space. CAUTION: Making popcorn in microwave can be very risky if not done in a correct way and can cause fire. Follow the instructions on the packaging, very carefully.